2 Channel digital heating programmer allowing independent control of central heating and hot water. The TRT036N is suitable for pumped and gravity fed systems, with an easy view blue luminescent screen. Simple push button setting and select modes with full screen information provide digital accuracy to help improve system efficiency and reduce running costs. 7 day programming for use with room thermostat. 3 timed control periods per day (5 day and 2 or 7 day programming). 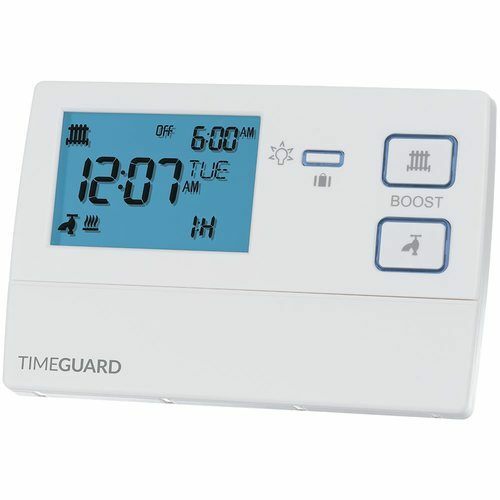 1, 2 and 3 hour boost function for central heating and hot water. Blue LED screen illuminates upon setting. Optional pumped or gravity operation set by DIP switches. 7 day factory fitted rechargeable battery backup.